It is truly amazing how much more meat comes off a good quality chicken. Not only is it tastier and doesn’t ooze liquid while cooking but it definitely appears to go further. The 2.5kg chicken we had from Prestbury Farm Shop yesterday fed six adults (as usual our grandson preferred just sausage!) and there was still some meat left on the carcass. So I boiled the carcass and stripped the remaining meat to make some soup for supper tonight. 1. Gently sauté the carrot, celery, garlic and onion in the oil until soft. 2. Add the chicken stock and chicken and bring to a simmer. 3. Add the rice and simmer for 10 minutes. 4. 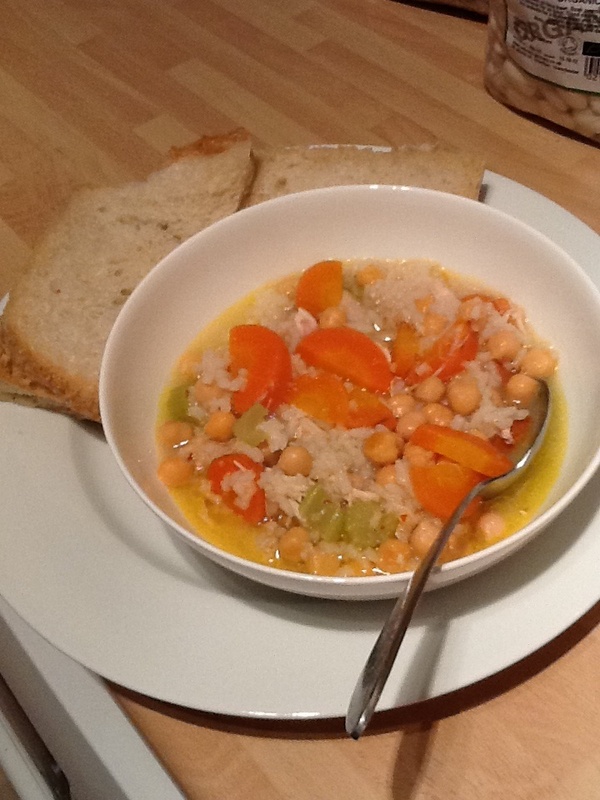 Add the chickpeas and season to taste – I sometimes add a sprinkle of chilli flakes. 5. Simmer for another 10 minutes and serve with crusty bread.